This blog has a serious lack of stir fry’s considering how much I make them on a weekly basis. Since I’m really bad at meal planning and coming up with dinner ideas more than 10 minutes in advance we usually end up having some sort of stir fry made up of whatever combination of meat and veggies we’ve got on hand at any given time. To be honest it’s probably because most of the time they’re nothing to write home about. 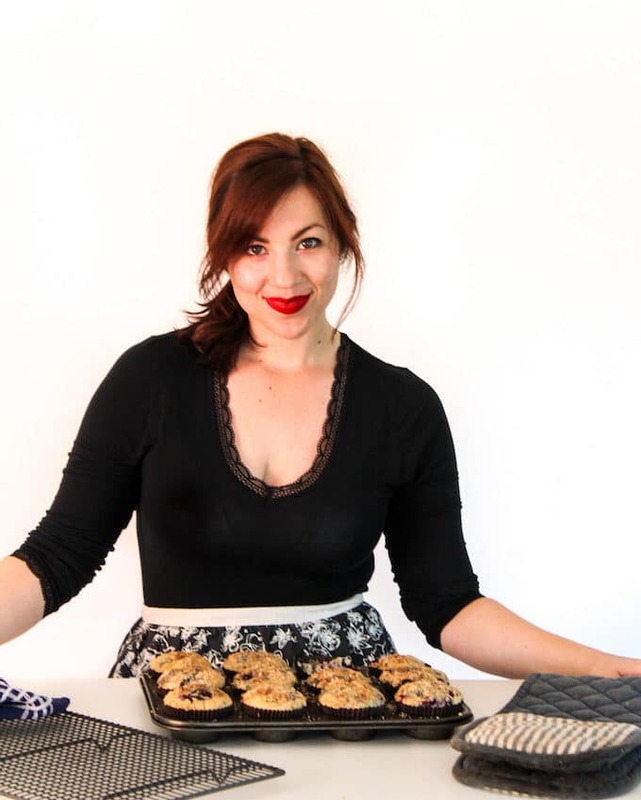 I like to save all the fun, tasty recipes to share on here and keep the boring, mediocre recipes to ourselves…and trust me there are a LOT of those. This stir fry is super easy to make and is ready in under 30 minutes. Making it can be broken up into two parts: the beef and the veg. The beef: slice your beef into thin strips. The thinner you slice the faster it cooks and the crispier it can get. Toss it in a little bit of sesame oil and coconut aminos. 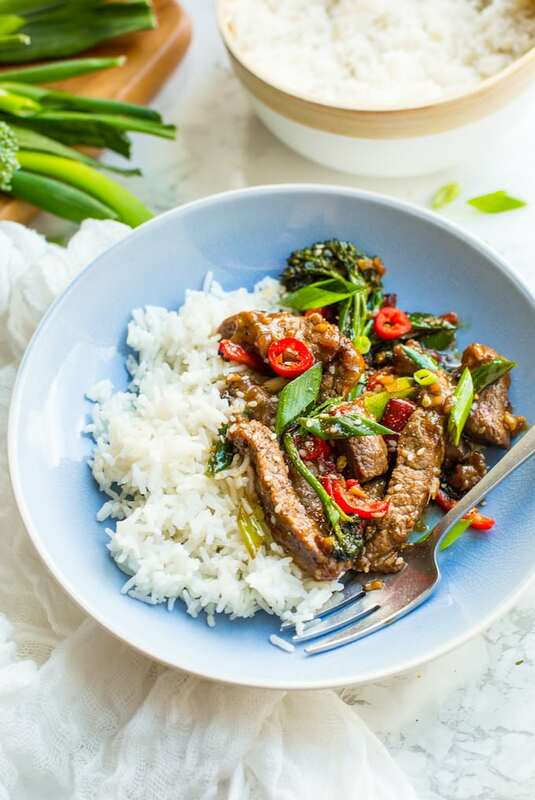 The coconut aminos here are used in place where you’d normally use soy sauce – if you’re alright eating soy then feel free to use that here instead. Let the beef marinated for about 10 minutes before tossing in a little bit of tapioca flour. Once done all you need to do is gently fry for a few minutes – let the beef crips up and then remove from the pan while you start working on the veggies/sauce. The veggies: After removing the beef from your pan add you veggies. We use broccoli and pepper here but you can mix and match with whatever veggies you’ve got on hand. Add the ginger, garlic and chili pepper and cook for a couple more minutes before adding the beef back to the pan along with the remaining coconut aminos. Drizzle over a spoonful of honey to sweeten and toss it all together. Taste and season with a little salt and pepper as needed. Personally when it comes to beef I go a little heavy handed with the black pepper because I think they were made for each other. Finally just mixed in your spring onions and sesame seeds and you’re all set. To keep this meal fully paleo serve with cauliflower rice – mix the cauli rice in with the beef and veggies to soak up some of the sauce. 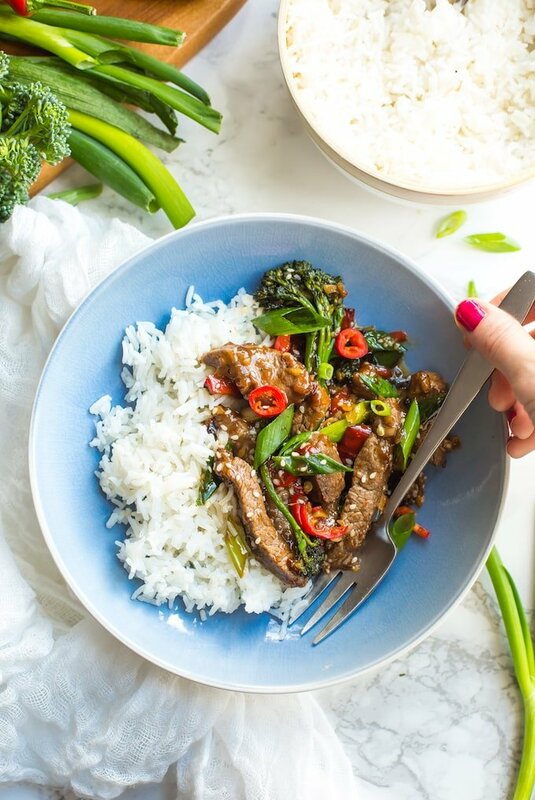 Don’t forget to #asaucykitchen on instagram if you try this Paleo Beef Stir Fry! We love seeing what you make! You can also post your pictures to my facebook page! Add your sliced beef strips to a bowl along with the sesame oil and 2 tablespoons of coconut aminos. Mix together and let marinate for 10 minutes. After 10 minutes add the tapioca flour and toss the beef to coat. Heat some coconut oil in large wok. When the oil is hot carefully add the beef strips and cook on each side. Make sure to leave a little space between beef pieces so that they can crisp up - cook in batches if you need. Once cooked on both sides use a slotted spoon to remove the beef and set aside on a paper towel. 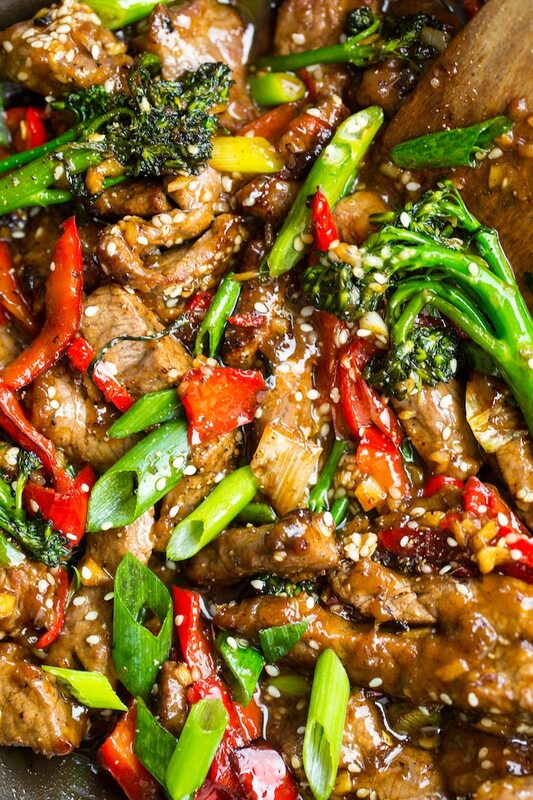 Add the sliced peppers and broccoli to your wok. Let cook for 3-4 minutes to soften. Add the ginger, garlic, chili pepper. Serve over rice or cauliflower rice to keep it paleo and enjoy. Tenderstem broccoli is much easier/faster to cook than regular broccoli. If you plan on using regular broccoli you may cut it up into smaller florets and steam for 4-5 minutes before adding it to the stir fry so that it cooks fully. Hi Sarah, I used tamari instead of coconut aminos and it was a big hit with my family. Thank you. Hi Diane – so glad to hear you all enjoyed it! Thanks so much for coming back to let me know what you thought!